Here's a fun chicken recipe to get you out of your weeknight rut. It's a twist on the classic beer can chicken—you know, the one where you sit the bird on top of a brewski? This version subs in a can of ginger ale. The can props up the chicken so it roasts evenly while the steam from the soda keeps the inside moist. 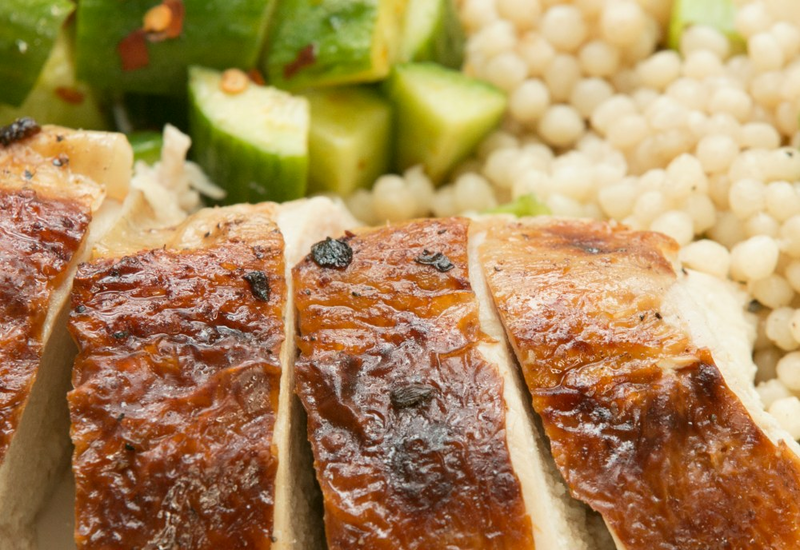 It's a foolproof way to crispy, juicy poultry perfection! Chinese 5-spice powder is awesome with the ginger ale and takes the meal to another level of flavor. If soda is not your thing, no worries. Here's a DIY substitute: Partially fill a heat-tempered canning jar with fresh ginger, brown sugar, and chicken broth. You can also use a ginger beer, which is a fermented ginger drink that is more gingery, less carbonated, and is still usually alcohol-free. Or if you want the traditional hint of beer, use a can of your favorite beer. Per Serving: 327 calories; 18g fat; 9.8g carbohydrates; 29g protein; 88mg cholesterol; 3468mg sodium. I never thought to use ginger ale for a 'beer can style' chicken. This was so tasty! The skin was cooked perfectly and the was still moist and tender. This was an awesome twist on on beer can chicken, which I've made a bunch of times before, but it's never turned out as good as this. Marinating it in the ginger ale added just enough sweetness to get the skin to caramelize in a really delicious way. Juicy, moist and tender. It had a sweetness that came from the ginger-ale but wasn't too ginger-ale like. I tried this again with an extra grape soda that someone had left behind at my house at a party and it's the only time that grape soda has worked for anything. Seriously, any sugary soda will do. the skin came out perfect! I'd never tackled the can method for cooking a chicken but it was surprisingly easy, and I also opted for the pearl couscous as the side like in the video. tasted even better the next day! I have made this many times and it always comes out great! Have also done it with Dr. Pepper--my kids like it better that way. When I make it on the grill I use a smoker packet to add a smoky flavor to the chicken. I like to use the leftovers in stir-fry or fried rice. The 5-spice and ginger flavor is killer with super spicy chilis and soy sauce!